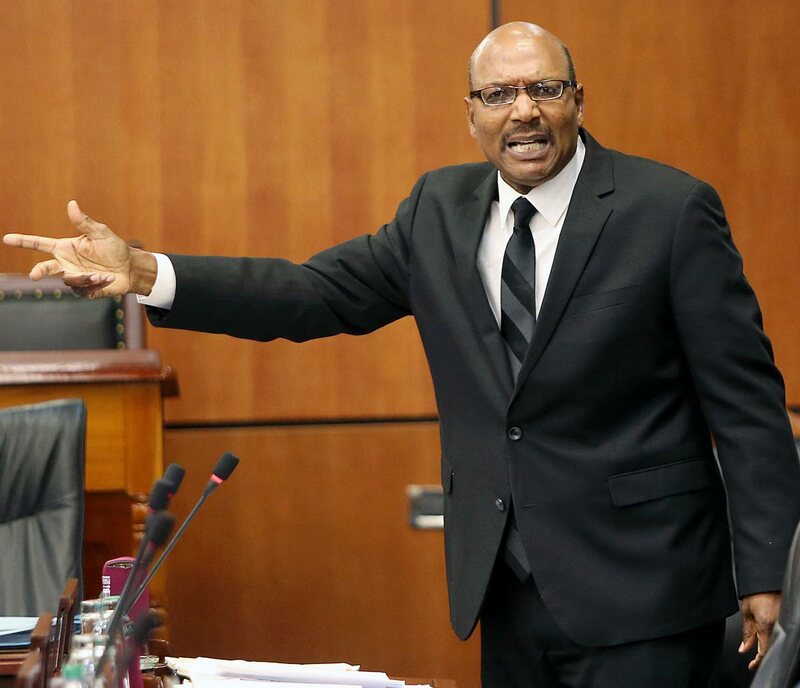 IF NATIONAL Security Minister Edmund Dillon, Foreign and Caricom Affairs Minister Dennis Moses and Government Senator Dr Lester Henry were members of a UNC administration they would have been “history” by now, says Opposition Senator Wade Mark. He made the comment yesterday while contributing to debate on the Anti-Gang bill. He said the weak leadership of the PNM had led to total confusion and chaos, and added that leadership was not about showmanship. Mark said Dillon, who was “hold up” in a court in New York, Moses and Henry would have been axed if they were a member of the Kamla Persad-Bissessar administration. The Opposition had made calls for Dillon to be fired over a civil suit against in a New York where he was accused of defrauding 88-year-old US citizen Neville Piper of a high-rise condominium in Manhattan; the case ended yesterday. Calls had been made for Moses to be fired over the controversial vote by TT representative to the Organisation of American States Ambassador Anthony Phillips-Spencer, against Dominica’s request for a waiver of OAS membership fees following the effects of Hurricane Maria. In December last year the Opposition called for Henry to be removed over a drunk driving charge which he pleaded guilty to. Attorney General Faris Al-Rawi stood on standing order 46:1 and said Mark was being irrelevant. Senate Vice President Nigel De Freitas advised Mark to get to the debate. Mark in his contribution said the Opposition supported the bill but would like it tweaked to protect the rights of citizens and avoid liabilities to the state for wrongful arrest. He said Government was using a one size fits all, draconian and oppressive approach to criminal gang activities but were not drilling down to analyse the root causes for the emergence of gang activity. Mark advised that Government’s hard line approach would not succeed especially in a society where 90 per cent of the wealth was controlled by two per cent of the population. Mark said there should be socio-economic policies and not the oppressive approach targeting working class people. He called on Government to invest in jobs, schools and programmes for young people otherwise the war on gangs would be lost. He said with the minority of crooked and corrupt police officers the legislation could be used to abuse the ordinary people of this country. Mark said incarcerating young people was “backward thinking” from the PNM and the Government should take some of the $25 billion spent on national security in the last three years and put it into preventative programmes to help young people. Reply to "Dillon and Moses would have been history under UNC"